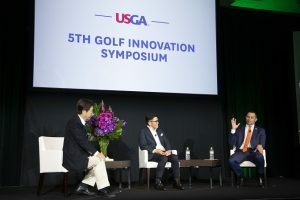 Following a two-day summit in Tokyo that elevated the latest global research in golf participation and sustainability, the United States Golf Association (USGA) has released key findings from its fifth Golf Innovation Symposium, presented by Cisco. Supported by the Japan Golf Association (JGA), the USGA brought together dozens of experts from around the world to advance its challenge statement to improve golfer satisfaction by 20 per cent and reduce the consumption of key resources by 25 per cent before 2025. The overwhelming support for the challenge statement underpinned the sessions, which focused on improving golfer experience and satisfaction, providing playing opportunities for all who wish to enjoy the game, and fostering innovation, productivity and efficiency among golf facilities. Japan Golf Association Chairman Tsunetada Takeda. Picture by USGA/Kotaro Fujii. Participation remains at the top of the golf industry’s list of priorities. Primary research conducted for the symposium provides direction for all facilities to better attract and retain golfers. Why people don’t play – Shigeki Mitsuishi of Yano Research highlighted cost as the biggest barrier to participation in Japan. How golfers start playing – Yano Research also revealed that nearly two-thirds of existing golfers in Japan took up the game through a business contact or friend, and that more than 90 per cent had their first golf experience at a driving range or short course. Satisfaction with short courses – In research conducted for the French Golf Federation, which spearheaded an effort to build 100 short-course facilities in France over the past 11 years, Sports Marketing Surveys determined that these facilities scored highest in offering a welcoming atmosphere and providing good value – the two most important factors among customers. Between 2009 and 2018, these facilities recorded more than 80,000 newly ‘licensed’ golfers, more 17,000 of whom were new golfers. Simulators as an entryway to the game – According to GOLFZON, which has installed more than 5,700 simulators in Korea, nearly 80 per cent of ‘screen golf’ participants have played golf on a green-grass course. No matter the country, measuring and improving golfer satisfaction is a key to the long-term health of the game. Identifying the factors that impact experience – In Japan as in the US, there is a fundamental perception gap between what golfers value during a round of golf and what facility managers believe golfers value. The symposium revealed that facility managers under-estimate the importance of factors such as distance to the course, course yardage and ease of making a reservation, while facility managers over-estimate factors such as service and pro shop selection. Reasons for playing the game – Golfer experience conducted by the University of Wisconsin-Stout for the USGA revealed that the top three reasons – by far – for playing golf are love of the game, spending time with family/friends and a desire to improve. Measuring golfer experience – During the symposium, the USGA, JGA and research programme Players 1st announced a pilot programme in Japan for using Players 1st to measure experience and satisfaction at several clubs throughout the country. Elite player experience – Data collection at the US Junior Amateur showed that a one-minute increase in starting-time intervals resulted in improvements in round times of nearly 20 minutes between 2016 and 2018. The cost of operating a golf facility and maintaining courses remain issues for the golf industry, and the symposium presented innovations in several areas. The USGA demonstrated two case studies for the USGA GPS Service – one at Kasumigaseki Country Club, site of the golf competition for the 2020 Olympic Games, the other at Crandon Park, a course owned and operated by Miami-Dade County in Florida. The USGA brought together innovators to showcase ideas, best practices and case studies that help facility managers and golf administrators to improve their operational and maintenance efficiency. Nobuya (Mike) Ishizaka, CEO of Golf Digest Online, shared analysis of data accumulated by his company’s tee-time reservation system that can improve sell-through rates and raise average green fees by more than US$30. Jeff Blume, President of the American Society of Golf Course Architects, shared survey results in which 47 per cent of private facilities and 39 per cent of public facilities in the US report that course renovations can help increase usage of their facilities. Hamanako Country Club in Japan initiated a solar and wind-power generation programme that reduces 1,250 tons of CO2 emissions annually and is expected to result in a positive return on investment in 16 years. Golf Australia’s consolidation of its golf administration operations at the national level resulted in the addition of 14,000 members and the reinvestment of US$4 million into programmes. *Select video presentations, as well as speaker biographies and summaries, can be viewed at usga.org/symposium.